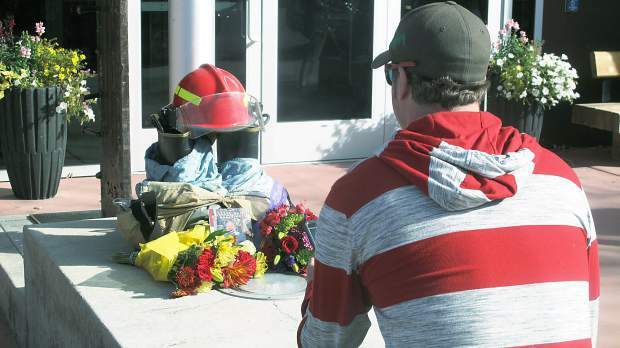 A shrine honoring Willard Clapper was set up in front of the Aspen Valley Fire Department in Aspen on Friday. Clapper died Thursday night. The following passage was written by one of Willard Clapper’s longtime friends, AO Forbes. It is a beautiful clear night, and Willard, or Little Chip as his mother so lovingly called him, has just passed away, so peacefully and with such dignity and grace. At 11:20 p.m on October 16th, 2014, with his wife Anne sleeping next to him with her hand on his chest, and his daughter Ashley caring for him, Willard took a very quiet last breath. There was no agitation, just a classy gracious moving into the magnificent starry, starry night, a night as uniquely a part of this valley as Willard is. We all share this contagious sense of reverence for such a wonderful human being who has lived life with such abundant generosity, relentless commitment to finding all that is good in life, always bringing out and tenderly holding on to the best in all of us. We have heard rumors that there is a huge welcoming delegation gathering just past Orion’s belt made up of Yellow Labradors and friends and students who have led the way. Willard Clapper was sleeping Wednesday morning when his wife woke him up. A group of visitors, nine in all, were at the door of the Clapper couple’s Emma home. They were there not just to pay a visit to their ailing friend and mentor but to honor him, as well. “I said, ‘Honey, you need to wake up,’ and he sat up anxiously,” said his wife, Anne Austin-Clapper. She told him to put on his pin recognizing his service with the Aspen Valley Fire Department. “He said, ‘Why am I wearing this?’” Austin-Clapper recalled. He’d find out soon enough, when the firefighters entered the house. “It was such a wonderful ceremony and such a wonderful honor for him,” Austin-Clapper said. Late Thursday night, Clapper died at his home after a battle with lymphoma, with his wife and daughter Ashley Austin by his side. He was 63. At the Aspen Valley Fire Department on Friday morning, the flag was raised at half-staff, and a bell was rung in his honor. A shrine, complete with a firefighter hat, boots and clothing, along with Clapper’s photo and flowers, was set up. Firefighters and friends dropped by the station, some taking photos of the shrine, others sharing hugs. His badge, No. 64, also was retired. Just last month, Pitkin County honored Clapper with the Greg Mace Award, named after a longtime volunteer member of Mountain Rescue Aspen who died from a fall during a training climb on the Maroon Bells in 1986. Clapper was a native Aspenite, and his story was recounted in an Aspen Times article in July. He and his father, Willard Charles Clapper, served the Fire Department for a combined 60 years. The younger Clapper recalled his time growing up in Aspen and his affinity for the tight-knit community. Clapper also was an elementary and middle school teacher for 29 years. He graduated from Aspen High School in 1969 and went on to play baseball and football at Western State College. He graduated in 1973 and later taught third and fourth grade at Aspen Elementary School. He also coached high school football and baseball. Services are pending. Balentine said the Fire Department plans to hold a block party to celebrate his life.